BRISBANE CEO Paul White has been grilled at an explosive press conference where he repeatedly defended Wayne Bennett's future at the club in 2019 but failed to guarantee what his future holds beyond that. 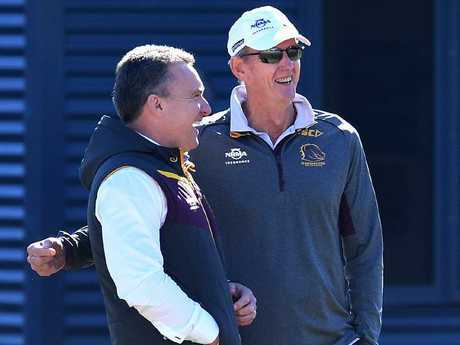 The Courier Mail revealed on Thursday the Broncos have identified former Souths coach Michael Maguire as the man to take over from Bennett, but will allow the 68-year-old to see out his contract through to the end of the 2019 season. Bennett asked for a one-year extension to take him through to the end of 2020 but that was reportedly rejected by club powerbrokers who are in the midst of a power struggle with the seven-time premiership winning coach. White fiercely denied the Broncos had approached Maguire - or current Rabbitohs mentor Anthony Seibold, who has also been touted as one of the frontrunners to take over - and although he admitted Bennett wants to coach into 2020, he would guarantee the veteran would be at the helm in 2019. Bennett (R) and White have reportedly fallen out after being friends for more than 30 years. "That story's not true," White said of the report linking Maguire to the Broncos. 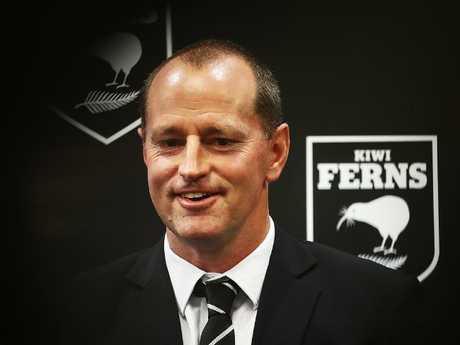 "Wayne's made it abundantly clear he wants to coach beyond the 2019 season and into 2020. "There's no risk to Wayne's contract in 2019." Pressed on whether Brisbane chairman Karl Morris had sent Bennett a letter offering him a position in the club's front office for 2020 - a peace offering which reportedly angered Bennett - White refused to confirm such a move had been made. He said it was not his place to discuss any dialogue between Morris and Bennett. White also refused to confirm he had a meeting with Bennett telling him to retire rather than drag his career out, saying it would be an invasion of privacy to put any such discussions into the public forum. The Brisbane boss was on the defensive throughout the fiery media conference as journalists repeatedly - and often angrily - questioned him about why he wasn't willing to be more transparent about Bennett's future and what coaches were on the table should the Broncos part ways with Bennett. White was adamant the club would not discuss plans for 2020 until after the completion of this season, doubling down on his position Brisbane was in no rush to find a new head coach because Bennett's position was secure in 2019. Bennett has repeatedly fuelled the fire about his future in the Queensland capital. More than once he's publicly called for the CEO and board to answer questions about the coaching saga, claiming he's been left in the dark, but until now, the top brass been quiet on the matter. White appeared to take a subtle dig at Bennett keeping the topic in the headlines, saying he hasn't been the one giving life to the drama. "Half the coaches in the competition are off contract at the end of 2019. Time's on our side here, we've got 14 months before we need to make a decision about who's coaching our club in 2020," White said. "I haven't pushed this issue in the public domain. "We've been consistent with that as a club. The commentary around … fiasco or crisis is just not the case." White defended the stance the club has taken as the furore at Red Hill plays out, saying it would not be pressured by outside forces to rush into a decision. "There's a desire to put some pressure on us and force our hand a little bit," White said. "I'm hoping that after today, as much as people will be critical of me or the club, on balance we are making the right decision for our future. "We won't be driven by the media." White also addressed reports of a player revolt at a BBQ he held at his home on the weekend. Skipper Darius Boyd failed to attend the event, instead choosing to spend time with Bennett at his house. When Boyd's teammates were made aware, many of them left White's place after a short time and joined Bennett and Boyd. White said talk of a damaging split at the club between the players and administration was blown out of proportion, saying he had no problem with the team backing its coach. "The players are entitled to support their coach and I don't see that as a bad thing," White said. "Wayne told me on Friday morning he wasn't coming around to my place. "Darius sent me a text message saying he was going over to the coach's house and I support that. "I'm disappointed they (the players) were drawn into something I don't consider a big story." Maguire, who coached the Rabbitohs to the 2014 premiership, has denied receiving a formal approach from any club about returning to the NRL coaching ranks next season. Michael Maguire is in the mix to take over. Maguire said he had "taken my head out of a lot of the chatter" about the coaching merry-go-round but revealed he was definitely interested in coming back to coach. "I'm aware that there's a lot of noise around the coaching but at the moment I have full respect for the coaches who are there and I'm not going to go into too much detail because I don't have any around the clubs that have obviously been put forward," Maguire told Macquarie Sports Radio. "We've had no contact so I'm not quite sure where that one has come from (talk of a link to Brisbane). They're a great club the Broncos and they're working through some things up there and as I said I've got full respect for the coaches that are there so I don't want to add to anything but no there's been no contact." Maguire said if he did coach in the NRL again, he would be selective in choosing which club he joined. "I've sat back and learnt a lot from my time at Souths and our time in Wigan and I guess once you've been in those positions where you've seen a club be extremely successful there's certain things that need to be in place," Maguire said. "To be able to go back into a club now with those things I'm keen for and I have seen work to create success, it's a very important part when you're picking a club." Maguire, who started a new job as the referees' coach this year, said his role means he is in constant contact with decision makers in clubland and while they've sounded out about what his interests are, he reaffirmed no official approaches for his services have been made. But fuelling speculation Brisbane remains an option, Maguire said moving away from Sydney would not be a problem. "I do a lot of talk of people in administration and CEOs and people like that so you have conversations where they're sounding (you) out and wondering what you're up to," Maguire said. "So I've had conversations like that but other than that it's just a waiting game now. "My kids are pretty used to flying about … they're into me everyday about when I'm going back to coaching so I think they want me out of the house so I think they're pretty keen for me to get into it wherever it might be."